Since her 2015 appointment to her newly created role, Sarah Hoover (DMA ’08, Voice) has re-invigorated Peabody’s historic engagement with a diverse array of agencies and organizations across Johns Hopkins and throughout Baltimore. 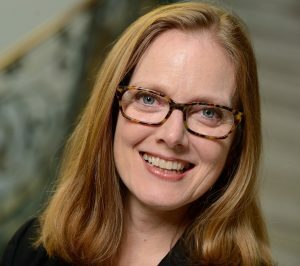 As the co-director of the new Johns Hopkins Center for Music and Medicine – the first organization of its kind in the eastern United States – Hoover leads a variety of interconnected efforts to meet the center’s mission: harnessing the healing power of music, and ensuring the health of musicians. She is working with colleagues across the university to conduct research, develop therapies, bring music into clinical settings, and bring multi-disciplinary clinical care to Peabody students and other musicians. Hoover has led the development of unique community engagement opportunities which both bring music to new audiences and help students hone important audience development skills. These include the Young Artists Development Series in partnership with El Paso Pro Musica, the Musician-in-Residence program, a partnership with Young Audiences of Maryland, and Peabody Pop-Ups. She has also taken a leadership role in the development of Peabody’s new Breakthrough Curriculum, which incorporates community engagement experiences into the core training of the 21st-century citizen artist. Prior to her appointment at Peabody, Hoover was an assistant professor of music at Hofstra University. She has had a career as a performer, teacher, and music journalist, and co-founded the Oyster Bay Music festival in New York. She is an active member of the National Association of Teachers of Singing and has served as the Eastern region president. Hoover is a graduate of Yale University and earned a Doctor of Musical Arts in Vocal Performance from Peabody.